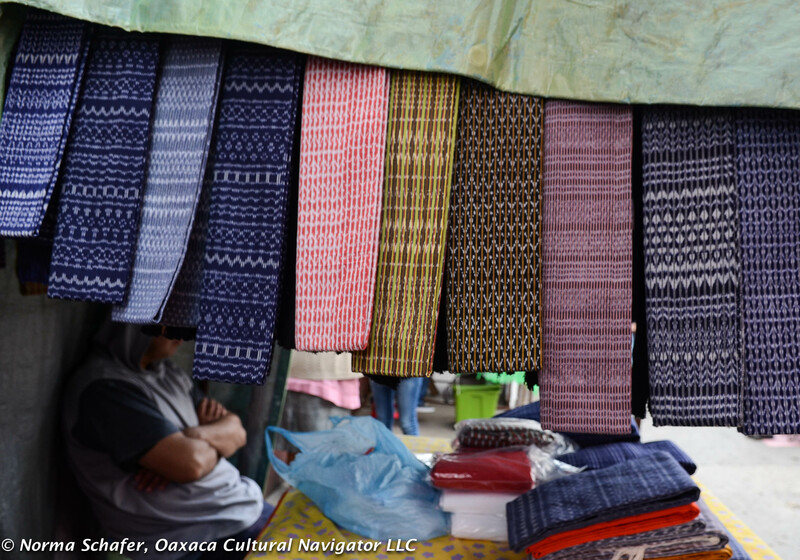 Sundays and Thursdays are tianguis open air market days in the ikat rebozo weaving town of Tenancingo de Degollado, Estado de Mexico. The Sunday market is the biggest and covers over four square blocks in the town center. 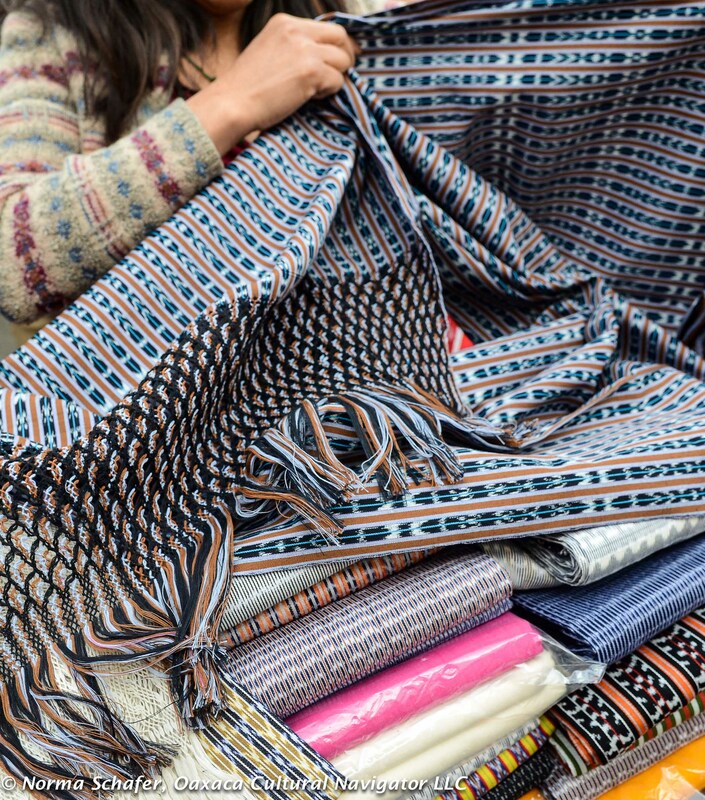 Most of the rebozos in the market are sold by the puntadoras, the women who tie the fringes on the hand-woven ikat textile. The cloth, or lienza, is woven by men. 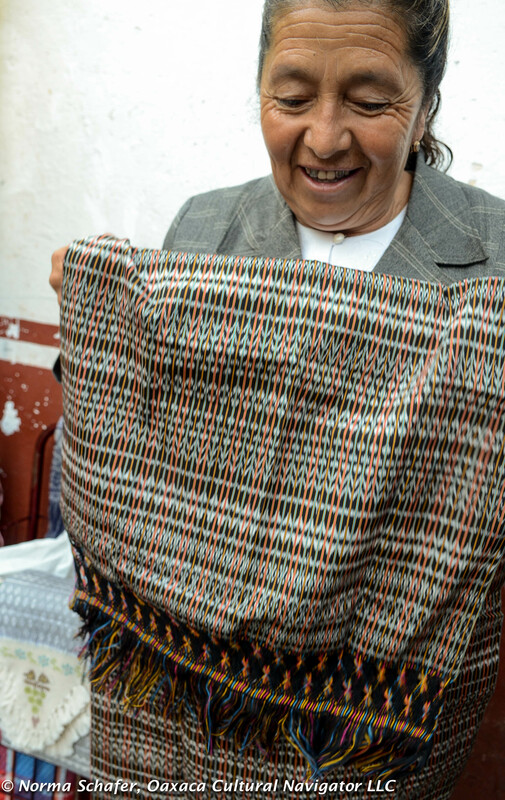 The puntadoras usually buy the cloth with the dangling warp thread directly from the weavers. They then spend a month, or two or three to hand-knot the loose warp fringe. The tighter and longer the fringe, the longer it takes. 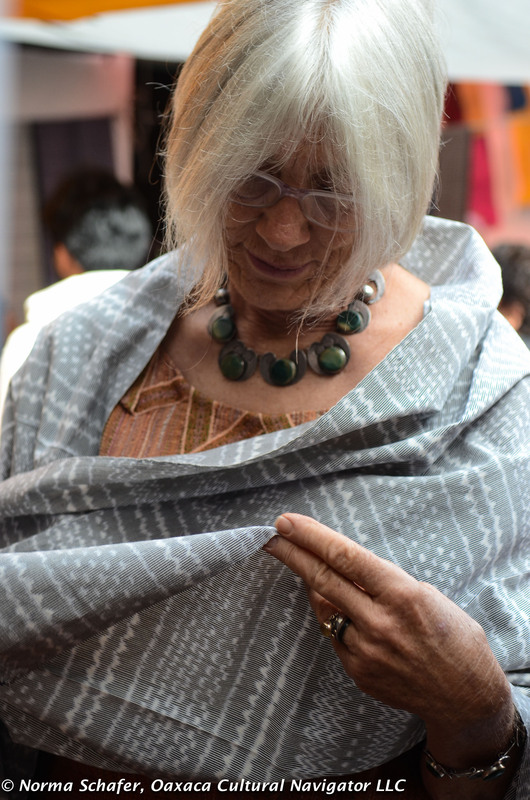 If it is an intricate design with a long, tight fringe, then the rebozo is even more valuable. Sometimes a puntadora will knot the fringe and then dip it in black dye (or another color) for a uniform color that they think will complement the textile. A famous master weaver will usually select his own puntadora who will tie the fringes for him. 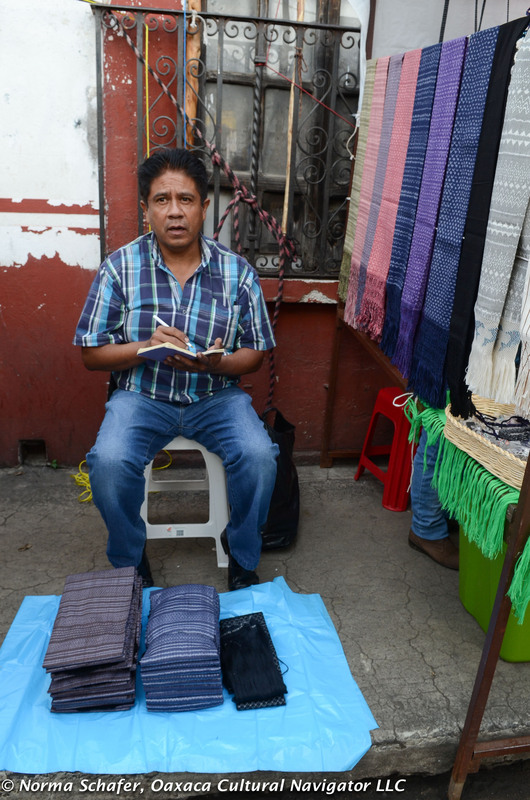 He will then sell the finished rebozo for between 1,600 and 15,000 pesos each. Click to convert to dollars. 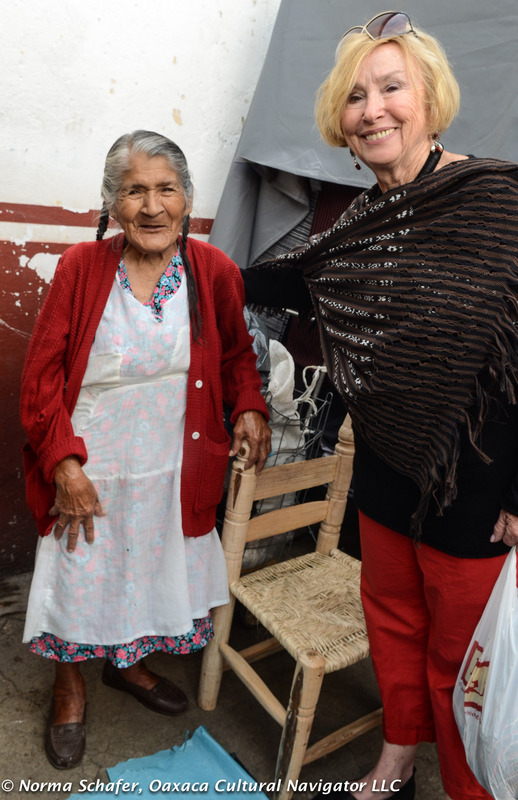 The rebozo market can offer more economical ways to buy. 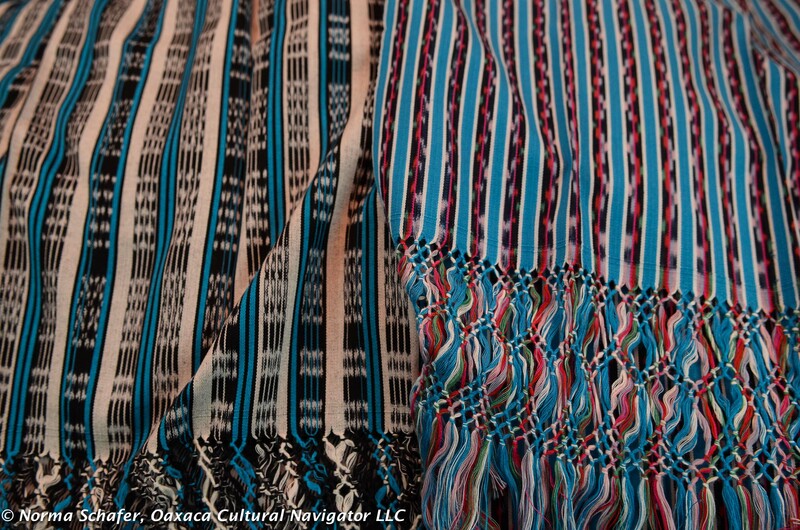 Usually the rebozos there that are knotted with a decent punta can start at 600 pesos and go up to 2,000 pesos. Once in a while, if you take your time and look, you can find a really great rebozo in this price range. That’s why visiting the masters first helps in the education and selection process. 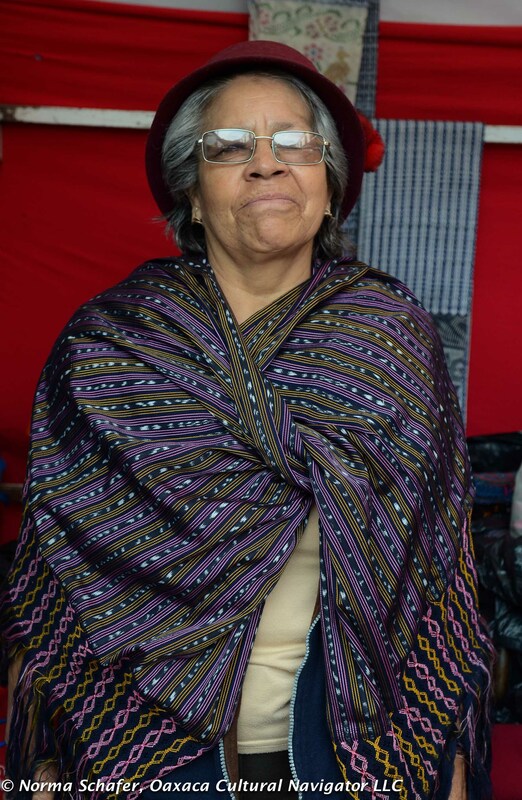 There is a discussion about the unsung role of the women puntadoras who contribute to at least 30-50% of the beauty of the rebozo, in my opinion. These women are unidentified, unnamed and it is the weaver who is recognized rather than sharing honors with the woman who makes the beautiful fringe. An issue about acknowledging women and something worth exploring more, don’t you think? 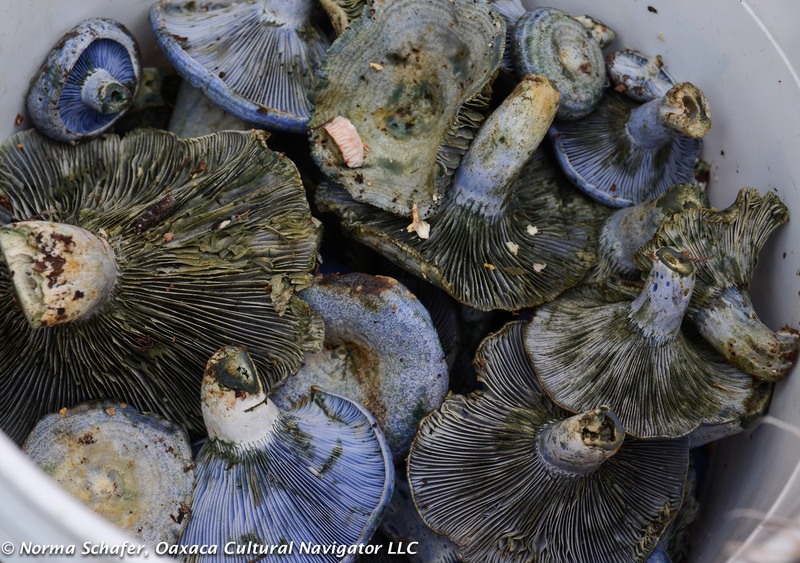 Edible blue mushrooms at the rebozo market. Go figure. I had the pleasure of traveling with Los Amigos del Arte Popular de Mexico this month on a rebozo tour of Tenancingo led by collector John Waddell. It was a wonderful experience. That’s why I’m organizing a textile and folk art study tour set for February 3-11, 2016 — to bring you back and share this with you. 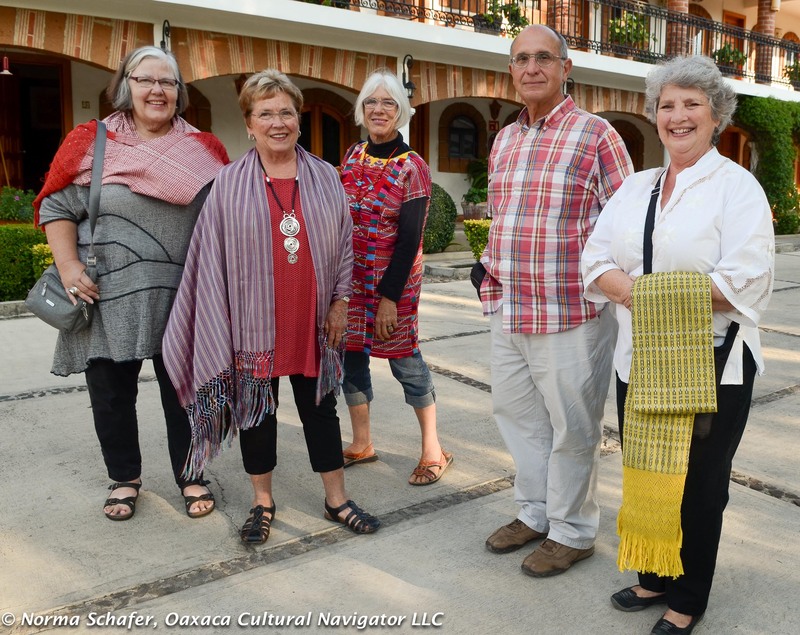 In February we will focus on the rebozos of Tenancingo, traditional Taxco silver at the William Spratling jewelry workshop, and the Tree of Life pottery of Metepec. I’ll post details of this trip on Friday on this blog. Stay tuned. Or, send me an email and I’ll send you the program description. This entry was posted in Cultural Commentary, Photography, Textiles, Tapestries & Weaving, Travel & Tourism, Workshops and Retreats and tagged Ikat, jaspe, Los Amigos del Arte Popular de Mexico, Mexico, rebozo, shawl, study, Tenancingo, textiles, tour, travel, weaving. Bookmark the permalink. I am traveling to Oaxaca October 22nd through 26th. 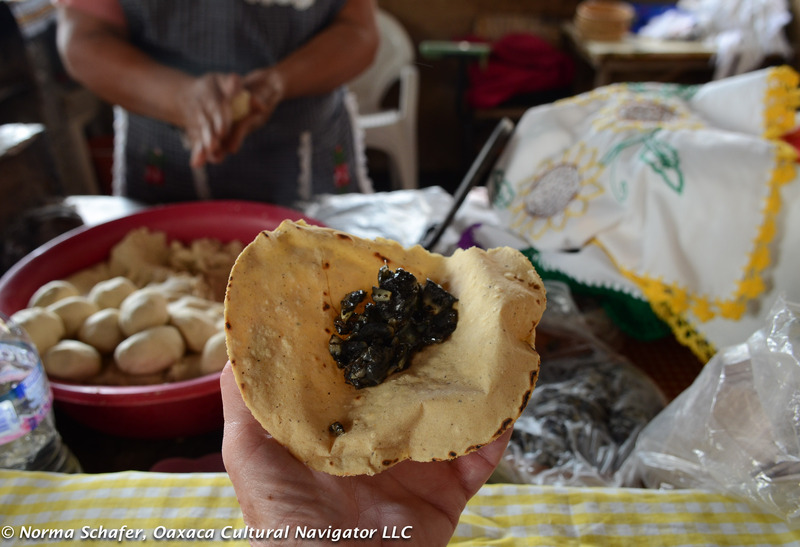 I am interested in visiting some Zapoteca artisans. Any helpful hints? Sorry if I spelled this incorrectly. 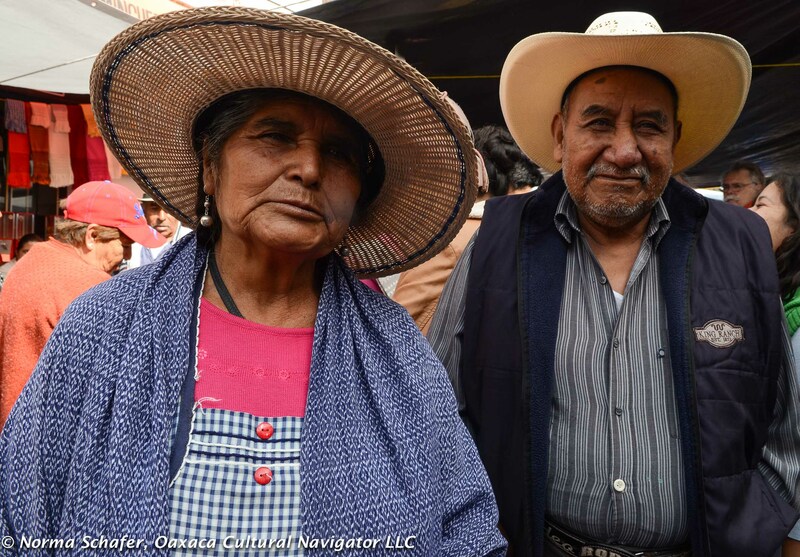 Priscilla, you might want to contact either Rene Cabrera Arroyo tours@lasbugambilias.com or Pablo Gonzalez marsch@prodigy.net.mx They are both excellent guides and can take you to the best of the best in Zapotec artisan villages. Please let them know I made the recommendation.